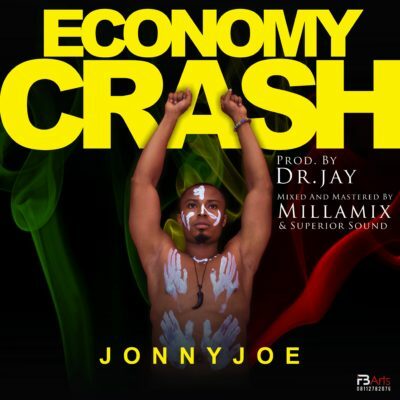 Download music by JonnyJoe – “Economy Crash” (Prod. By Dr. Jay) mp3 now. Listen & Download JonnyJoe – “Economy Crash” (Prod. By Dr. Jay) as it is hotly served. Afro Star, JonnyJoe releases a perfect song that truly speaks the mind of the people. “Economy Crash” describes the bitter truth about Nigeria and her Economic crisis. Inspired by Fela Kuti’s Afrobeat genre of music, The song will make you dance and be inspired by the Lyrics. Produced by Drjayondbeat, Mixed and Mastered by Millamix and Superior sound. And the awesome video which was shot somewhere in Lagos State Nigeria by JudeFabObi drops eight days after the audio. NB: Please be aware that JonnyJoe – “Economy Crash” (Prod. By Dr. Jay) is hosted outside this particular website as we host NO file. In case of any copyearight claim and request for take down, kindly use our 'contact us' page to put a notice across.